Home NEWS MP 'exposes' Chebukati's scheme to force a constitutional crisis before October 26. MP 'exposes' Chebukati's scheme to force a constitutional crisis before October 26. Gatanga MP Eng. Joseph Ngugi addressing residents at Kamahuha shopping centre in Maragua constituency during "Kuumira Kuumira" road caravan. Kiharu MP Ndindi Nyoro has alleged that IEBC chairman Wafula Chebukati is plotting a scheme to create a constitutional crisis to deny President Uhuru Kenyatta second term in office. 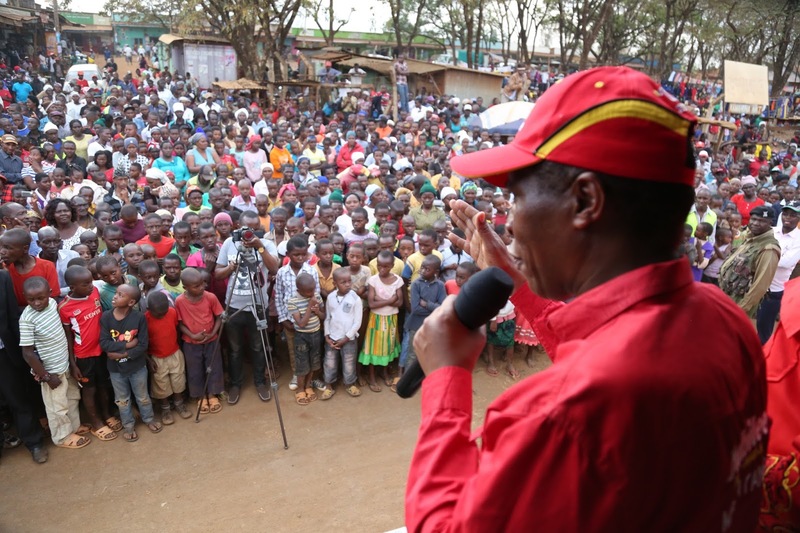 While speaking during a presidential vote hunt campaign in Maragua Constituency yesterday, Ndindi claimed that the IEBC boss was working in cahoots with opposition’s NASA to decline declaring President Kenyatta winner even if he wins in the October 26 presidential rerun. Ndindi who was in the company of other Murang’a MPs and Senator Irungu Kang’ata added that the Judiciary was also intertwined in the plot with Justice David Maraga expected to refuse to swear in Kenyatta. This will consequently create a constitutional crisis which will eventually pave way for negotiations of a coalition (NUSU-MKATE) government between the president and NASA leader Raila Odinga. However, Nyoro explained that Jubilee Party was working out a plan to counter such mischief citing the election laws amendment bill before parliament as one of the measures. “Jubilee (Party) will apply all legal means to ensure the President will be sworn in after winning in the rerun even if Chief Justice will not agree to do it. With or without Raila’s blessings we will take full advantage of our majority in the national assembly to pass these amendments,” said Ndindi. Alice Wahome (Kandara) and Ruth Mwaniki (Kigumo) accused the Opposition of shifting goal posts ahead of the poll through the issuance of fresh hurdles just to force a caretaker government if the fresh presidential election were not held within 60 days as ordered by the Supreme Court. Alice reminded Kenyans that if the election was not held on October 26, Uhuru Kenyatta will continue serving as President until a new leader was elected and sworn into office. She defended the move to sponsor amendments to the Elections Act, saying the Supreme Court’s judgment cited flaws in the law that needed to be fixed to avoid a repeat of mistakes that led to the nullification of the August 8 presidential election after he had been declared victorious. Senator Kang’ata also drummed up support to have the laws amended and save the country from future set ups that can be set by people of bad will. “The proposed amendments are for the good of the country and are meant to improve the handling of elections in Kenya,” said Kang’ata. Maragua MP Mary Waithera and her Gatanga counterpart Eng. Joseph Ngugi pointed out Jubilee achievements in the area among them construction of roads, some which are in progress. They condemned cartels whom they say are conning residents in the name of government where the cartels are asking residents to pat with Sh.10, 000 so as to get employment on road construction sites. This week, Jubilee Party sponsored two motions in Parliament aimed at amending two laws — Elections Act and Election Offences Act with the aim of curing anomalies in the administration of elections, which were the reasons for the invalidation of the outcomes of the August presidential election. “chairperson” to include, where the chairperson is absent, the vice chairperson, or any other person acting as the chairperson, if both the chairperson and the vice chairperson are absent. Without these amendments, Wanyonyi Chebukati, as the sole legally qualified member of the IEBC, is the only one currently qualified to become its chair. It also proposes to change the mode of election results transmission so as to stipulate that results shall be transmitted both electronically and manually, raise the threshold of nullifying elections and makes provisions to govern the conduct of fresh election pursuant to Article 140(3) of the constitution. In effect, the new legal standard will be that courts of law will not be able to annul the results of an election unless the petitioner is able to show, first, that the election was not conducted in accordance with the applicable law, and second, the non-compliance had an effect on the results. Finally, the proposed amendments makes it an electoral offence punishable by up to five years imprisonment for any presiding officer or returning officer to knowingly or willingly fail to sign, complete, falsify or submit electoral results forms. The bill guarantees that the October 26 election will proceed and declaration of the winner made. That notwithstanding, if Raila withdraws his candidature, then IEBC will have to declare Uhuru Kenyatta as duly elected President without conducting the fresh election.